One of the most important things you can do to increase engagement and adoption of an enterprise social network (ESN) and employee community is to invest time and resources in branding and marketing it. At Walgreens we’ve invested a lot of time into branding and marketing our ESN and social intranet experience and it’s been a key element to our success. On this post, I’d like to share with you a little bit of our branding and marketing journey and explore what we’ve learned along the way. No, the name wasn’t inspired by Pink Floyd. Instead we arrived at it by combining the Walgreens “W” and “all,” meaning that this new community space and experience is designed to be a place where both corporate and store employees can “all” come together to make their mark on “a Wall” with the hope to have their voice heard, collaborate and most importantly learn how to work more efficiently and effectively and create the future of work together so we can serve our customers better. Since launching two years ago, the original vision and essence of The Wall brand remains but it has taken on a life of it’s own. In many ways team members have personalized The Wall brand on a deeper level and, as I’ve said many times, The Wall isn’t just an online destination but for many employees who have embraced this new way of working, being “on The Wall” has become a state of mind. For us, The Wall brand has also come to symbolize a new way of working and put a broader context and meaning to working out loud and introducing the future of work. We couldn’t have created an emotional connection if we just relied on the vendor platform name. We had to make it our own. We had to create a brand that meant something. We had to first create a meaningful name and brand that team members could take and make their own. And in many ways that’s exactly what’s happened. The thousands of posts, contributions and actions that now make up The Wall online experience have further defined and evolved what The Wall brand means. 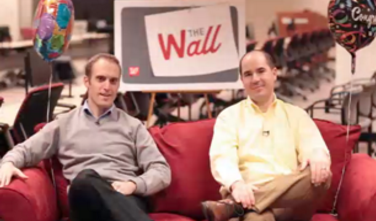 To help further extend and market The Wall brand, and the tell the story of business value that The Wall Community delivers, we also created a video series called “Off The Wall.” Basically, “Off The Wall” was created as a channel to have a different type of conversation with employees that we haven’t had before at Walgreens. The video series features me on the Red Couch going to different locations across the company having conversations with leaders, stakeholders and other employees about how The Wall is supporting the business and helping them work better. Again, like The Wall brand, the Red Couch and the “Off The Wall” series has taken on a life of it’s own and really resonated with employees. 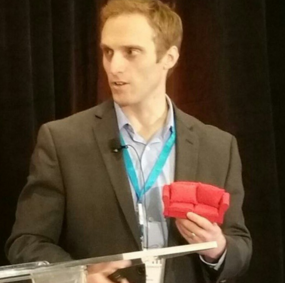 To take the marketing even further, and because we can’t always take the big Red Couch everywhere I go, we also have a mini Red Couch that I take with me to meetings, company events and industry conferences. The mini Red Couch is a fun and engaging reminder and a great conversation starter to talk about what is happening on The Wall. When I take the mini Red Couch with me to company meetings I put it on the table and it always gets some interesting conversations going with people who have not yet had an positive interaction on The Wall or haven’t heard about the valuable collaboration happening with our employee communities. To market The Wall we also have a Wall sign (featured in the photo below) and flyers to promote events and feature specific success stories to bring new people in and convert skeptics into believers. We also have Wall lanyards that I give to our Wall Champions so they can go forth and spread the good word and be identified around the company as ambassadors helping to onboard and answer questions and share their own personal success stories. Captured in the photo above is one of my most memorable Wall moments thus far. 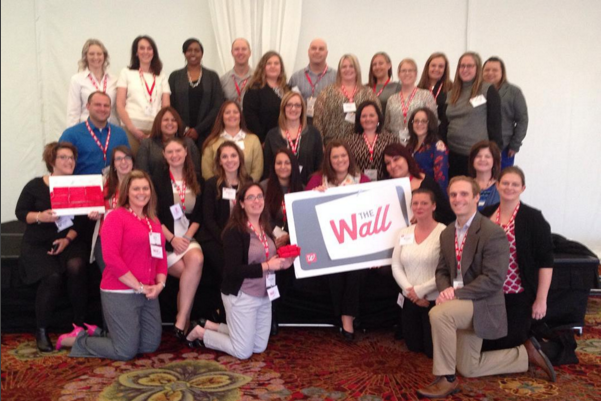 It’s me with our Wall Champions from our Field HR team. This team recently played a critical role in a live event in October during which we integrated The Wall Community into a week long conference. It was inspiring to see these Wall Champions in action helping their team members get onboarded and discover their own Wall “aha” moment. And I loved what they did with the Red Couch brand. In the left hand side of the picture you can see someone holding a white canvas with the Red Couch on it. To measure success of the event, we had a success metric and goal to grow one of Field HR online groups to a certain number members and to my surprise one of The Wall Champions showed up at the event with the canvas drawing. So as we grew closer to our goal they colored in a cushion of the Red Couch! At the end of the event I had them all sign the drawing and it made me very, very proud. Again, this special and engagement moment wouldn’t have been possible if we didn’t have a unique and personal brand attached to our ESN. As you can see, if you don’t brand your ESN, you’re missing out on several valuable emotional connections, engagement opportunities and many word of mouth benefits too. A strong and meaningful ESN brand gives your champions something to share, something to talk about. To make this new way of working more tangible and contagious you must have a unique brand for your ESN. And you must find a way to extend that brand beyond the online and virtual experience. When you create a unique ESN brand and drive it with a market strategy that powerful combination makes the ESN experience more real for employees. It helps to connect the vision and purpose of the ESN with the vision and purpose of the company. An ESN branding and marketing strategy makes the community contributions and collaboration more palpable, meaningful and memorable. So, whatever you do, don’t rely on just calling it whatever platform you’re using like Jive, Yammer, etc. Get creative and fight hard to make sure your community has it’s own brand and make sure to invest time and resources to market it. You’ll be glad you did. These are just a few things we’ve done and learned along the way and I look forward to sharing more about our ESN branding and marketing journey in the future. What can you do next? Well, one thing I encourage you to do is to join us today for this week’s #ESNchat on Twitter which is about branding and marketing your ESN. We’ll be exploring many of the topics I shared above and more, and I hope to see you there in the conversation. To learn more about #ESNchat and how to join this week’s chat go here.